To capture and control on Earth the fusion reactions that drive the sun and stars, researchers must first turn room-temperature gas into the hot, charged plasma that fuels the reactions. 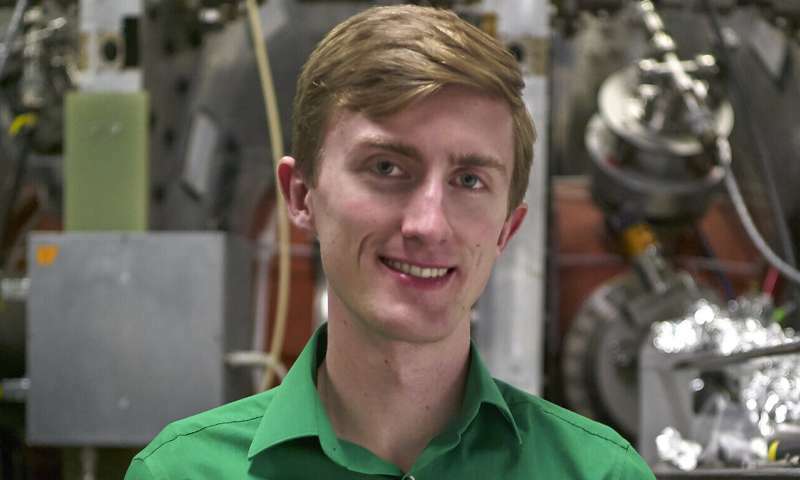 At the U.S. Department of Energy's (DOE) Princeton Plasma Physics Laboratory (PPPL), scientists have conducted an analysis that confirms the effectiveness of a novel, non-standard way for starting up plasma in future compact fusion facilities. The innovative technique, known as "transient coaxial helical injection (CHI)," eliminates the central magnet, or solenoid, that launches the plasma inside tokamaks, the most widely used fusion facilities. Such elimination could facilitate constant, or steady state, fusion reactions and also free up valuable space in the center of compact spherical tokamaks, whose cored-apple shape has less room inside than conventional doughnut-shaped tokamaks that are more common. The freed-up space could provide advantages: It could be used to strengthen the magnetic field that confines the plasma and thereby improve its performance. Elimination of the solenoid could also simplify the design of compact tokamaks. Fusion reactions fuse light elements in the form of plasma—the hot, charged state of matter composed of free electrons and atomic nuclei that occurs naturally throughout the universe—and thereby generate energy. Scientists are seeking to replicate fusion on Earth for a virtually inexhaustible supply of safe and clean power to generate electricity. Solenoids run down the center of a tokamak and induce current in the uncharged gas that researchers inject into the facility. The current strips electrons from the atoms in the gas, turning it into a charged plasma—a process called "ionization," or plasma breakdown. The current also creates a magnetic field that combines with the field produced by magnets that surround the tokamak to bottle up and control the plasma, enabling heating heating to produce fusion reactions. By contrast, the transient CHI process reported in Physics of Plasmas produces the crucial electric current with electrodes placed near the bottom or top of the tokamak, eliminating the space-eating solenoid. "What we primarily focused on was the beginning stage of forming the plasma," said physicist Kenneth Hammond of the Max Planck Institute of Plasma Physics, the lead author of the paper who did research on CHI as a Columbia University graduate student at PPPL and is joining the laboratory this summer. "This helped paint a fuller picture of how CHI discharges work." Transient CHI—so-called because the electrodes that produce the plasma-launching current run briefly rather than continuously—was first developed in experiments on the small Helicity Injection Torus (HIT-II) at the University of Washington and the larger National Spherical Torus Experiment (NSTX) at PPPL prior to its upgrade; the process also had been modeled at PPPL. The experiments, which showed that transient CHI could be scaled up from smaller to larger machines, motivated the recent study, said Roger Raman, a University of Washington physicist on long-term assignment to PPPL and a coauthor of the paper. The study found that the placement of CHI electrodes in the earlier experiments "could exhibit a severe weakness when scaled up to a reactor," Hammond said. He then analyzed an alternative electrode configuration similar to one presently used in QUEST, a spherical tokamak in Japan. The findings showed that the alternative configuration could scale up well in a future spherical tokamak-based fusion facility designed at PPPL. "The good news from this study is that the projections for startup in large-scale devices look promising," Hammond said. The CHI technique has valuable potential, concurred Tom Brown, a principal engineer at PPPL who helped design the concept of the future spherical facility. "If successful, CHI could provide space for interior components that could enhance the performance of spherical devices," Brown said. However, he added, "further engineering details need to be developed at the experimental level that also can work within a higher-level [demonstration] device and also in an eventual fusion power plant." Researchers have thus far tested the CHI scaling in simulations conducted on the Tokamak Simulation Code, a computer program created by PPPL physicist Stephen Jardin that has modeled plasmas around the world. Jardin, a coauthor of the Physics of Plasmas report, worked with Raman to produce the simulation referred to in the paper. "Although CHI has never been tested on a large reactor-scale device," Hammond said, "we are optimistic that the same relationships will hold on the larger size with stronger magnetic fields." Future experiments are scheduled on URANIA, a solenoid-free spherical tokamak at the University of Wisconsin-Madison. The new experiments will test the startup of plasma with two independently operated transient CHI electrodes—a configuration that could produce greater flexibility for optimizing the promising system.